These pages provide a brief history of The South Australian Ornithological Association. The SAOA celebrated its centenary in 1999. The Association was founded in Adelaide on 17 March 1899 with seven members and is the oldest birding association in Australasia. The founding members were Edwin Ashby (land broker and estate agent), J.W. Mellor (farmer and pastoralist) , M. Symonds Clark (land broker and estate agent), Dr A.M. Morgan (medical practitioner), A.H.C. Zietz (Assistant Director of the South Australian Museum) and F.R. Zietz (Museum Assistant at SAM). At a second meeting on 24 March 1899 when the draft set of rules were ratified Captain S.A. White (racehorse owner, explorer) was also present. 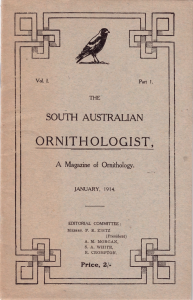 In January 1914 the first part of The South Australian Ornithologist was published. In 2001 we adopted the much simpler name of Birds SA. Birds SA retains the original focus of the SAOA. We are a non-profit organisation dedicated to the conservation and study of Australian native birds. Below is a historical timeline for the SAOA, gleaned from the book Birds, Birders & Birdwatching 1899-1999 published in 1999 to celebrate the organisation’s centenary and up to the present time. A two-week planning camp was held at Port Victor (Victor Harbor). The South Australian Ornithological Association was established in March 1899 with seven founding members. The founding members comprised a group of collectors and/or aviculturists. Most of the early meetings comprised discussions based on ‘show and tell’. As early as the second meeting the members resolved to seek a deputation with the Premier “urging upon him the necessity of protecting our Forest Reserves. First excursion to the ‘Grange Pine Scrub and Tea-tree swamps’ north of Grange. A Checklist of Australian Birds was approved after 18 meetings of the ‘List Committee’. The work of the SAOA started immediately after the Association formed. SAOA became involved in lobbying for the reservation of the western end of Kangaroo Island, partly because Cape Barren Geese were being killed at their breeding ground. The Australian Ornithological Union held its Congress in Adelaide and a campout was arranged on Kangaroo Island. The Chief Justice, Sir Samuel Way accepted the position of (the first) Patron of the Association. Six ‘Mallee Hens’ were released at Harvey’s Return on Kangaroo Island, due to the SAOA’s concerns about clearing of scrub lands on the mainland. The lack of foxes on the island led SAOA to believe that this would be a good place to liberate the malleefowl. Most of the expenses were covered by the Association, although he government did provide a grant of £10. This seems to be the first ever translocation of Australian native birds for their protection. The SAOA undertook to bring the conservation message to children. Mr A.G. Edquist became President in 1917, having been a member since 1910. He was teacher with the Education Department and was a strong advocate of ‘Nature Study’. Mr Edquist established a competition for the best essay on bird protection and members dug into their own pockets to purchase the a Silver Challenge Cup trophy. 5,000 kids from 135 schools were involved in this first year!! SAOA took out a lease of the islands in the Coorong between Woods Well and Salt Creek, in order to protect wildlife in general, but particularly the only known SA breeding ground for the Pelican. Signs were put up and several locals acted as ‘custodians’, and there was a significant increase in breeding on the island after only one full year. A time of expansion with eleven new members were admitted – a record at the time! F.R. Zietz observed that far fewer birds and eggs were being donated to the South Australian Museum, and attributed this in part to the acceptance and success of the conservation laws. The first edition of the South Australian Ornithologist was published. The Mathews Australian Collection, totaling some 47,000 specimens, including many skins from S.A. White, J.W. Mellor, Edwin Ashby, Frank Parsons and J.B. Cleland, is first offered to the Australian Government. It was passed up and found it’s way to New York. Further malleefowl liberations occurred on KI. By 1968 the birds were thought to have died out on the island. The "Birds of South Australia" by John Sutton was published in the South Australian Ornithologist. 356 species were listed but did not include any introduced species. An updated edition of the "Birds of South Australia" was published in the South Australian Ornithologist with 359 native species listed. H.T. Condon published another list of the "Birds of South Australia" in the South Australian Ornithologist. It listed 385 species with a further 9 introduced species. S.E. Terrill & C.E. Rix compiled "The Birds of South Australia. Their Distribution and Habitat". This was the first modern state list of birds, comprehensively annotated with regional distribution, and was published in the South Australian Ornithologist. 381 species and no introduced. The “Civil War” was prompted by Brian Glover and Richard Schodde proposing that the Association recommend to the state government that a new schedule for the protection of rare species be incorporated into the Animal and Boards Protection Act. Opposed by aviculturists in the membership a series of stacked meetings resulted in the proposal being rejected, then accepted, and then rejected again! To settle the ‘Civil War’ dispute the proposal was put to the whole membership, and 60% voted in favour of supporting special legislative protection for rare and endangered fauna. This was the first of it’s kind in Australia. Aviculturists and other disenchanted members formed the Adelaide Ornithologists’ Club. The Association’s committee ran a sponsored symposium on nature conservation; spawning the formation of the Nature Conservation Society of South Australia, three years in advance of the Australian Conservation foundation. H.T. Condon wrote the first comprehensive list of all species including sub-species "A handlist of the birds of South Australia with annotations". This list had a total of 390 species. Birds SA is adopted as the 'common name' for the SAOA to help the wider public to recognise who we were and what we did. Birds SA refreshes its branding to help our appeal to non-members. The new logo and website recognise that Birds SA is as much about people as it is about the birds!